To date, CubeSats largely have served as education platforms used to train university students in the basics of building a simple spacecraft. A number of space agencies and laboratories, though, are now working to evolve these tiny spacecraft so they can take on serious scientific studies, including missions to the moon, asteroids and planets. CubeSats were invented in 1999 at Stanford University to enable university students to design, build, and fly real satellites. In the fifteen years since, the standard has taken off with satellites built by numerous universities and several space agencies all contributing to the 138 launches listed by Wikipedia (which admits that its list is incomplete). A basic CubeSat is 10 x 10 x 10 cm (1 liter) satellite that weighs no more than 1.3 kilograms. Within that space, the satellite has to perform all the essential functions of a satellite: power, command and control, communications, and possibly operate a payload that makes some type of measurement. The specification allows for cubes to be stacked to create spacecraft of 2, 3, 6, and 12 liters, or units (U) as they are called, to be built. (A 3 U CubeSat is about the size of a loaf of bread.) The total cost for developing a simple CubeSat can be as low as $10,000 (although launch costs can be as much at ten times that). 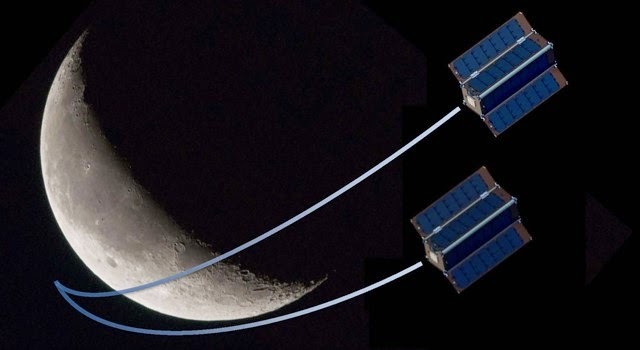 Today, technology has advanced to the point that several projects are underway to build CubeSat-inspired spacecraft for lunar and planetary exploration. One of the reasons I say ‘inspired’ is that while many of the proposals would be based on CubeSat 3 U and 6 U sizes, some of the designs use different forms factors while still maintaining the spirit of a nano-spacecraft (less than 10 kilogram) design. The other reason I say ‘inspired’ is that a planetary CubeSat will have to take on challenges that their predecessors haven’t. 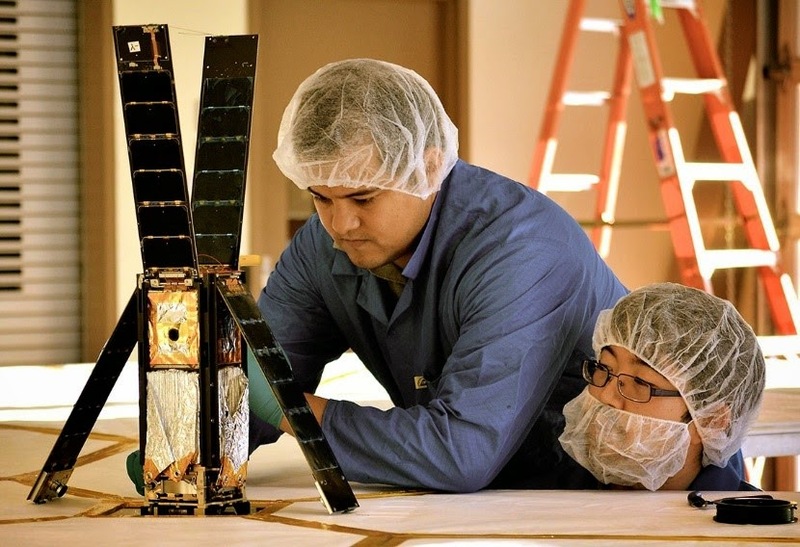 For many CubeSat missions to date, the focus has been on the learning experience for students, and high reliability and long-life have not been goals. Also, all CubeSats have orbited the Earth where the magnetosphere shields them from radiation, sunlight is plentiful, and communicating with stations on the Earth is simple. To operate in deep space to explore the solar system, engineers are taking on the challenges of building reliable, long-lived spacecraft, adding radiation hardening, fitting propulsion systems within the tiny form factor, and communicating across tens and hundreds of millions of miles. Then there’s the challenge of miniaturizing instruments so they can return data worth the costs of the mission within the tight space, weight, power, and communications restraints of CubeSats. In other words, CubeSats for lunar and planetary missions are a work in progress. I’ve talked with several people knowledgeable about planetary exploration about CubeSats, and their reactions range from enthusiasm to outright skepticism that that these ‘toys’ can be scaled up to meet the challenges of planetary missions. I spent 25 years in the high tech industry, often working with teams of engineers developing cutting edge technologies. I learned that if the base technologies exist (you couldn’t have asked an engineer in the 1970s to build a CubeSat), then smart engineers will find a way to do it. I also learned that the cost of achieving these breakthroughs is often higher than you expect. Planetary CubeSats are likely to cost in the millions of dollars apiece, and the total cost to make planetary CubeSat technology off-the-shelf equipment may be several tens of millions of dollars. Even at $5M a pop, though, a CubeSat mission would still cost just a few percent of the cost of the smallest planetary missions in flight today. For comparison, many instruments on planetary spacecraft cost millions and tens of millions of dollars. Another thing I learned in the computer industry is that size and cost revolutions don’t make the big machines obsolete. The market for big, expensive mainframe computers is alive and well despite personal computers and smart phones (and in many ways, because of them); the new technologies just made mainframes awesomely more capable than their predecessors. We will still need highly capable, large, and expensive planetary missions to answer our questions about the solar system. CubeSats and nano-spacecraft, I believe, will fill holes where the larger missions don’t go or will serve as auxiliary spacecraft for their bigger brethren. I expect they also will serve to train new generations of engineers and scientists who can learn their arts on inexpensive missions. I expect that in ten to fifteen years planetary CubeSats will be a proven approach. It will help that scientists studying the Earth and cosmos also see promise in CubeSats. Their efforts to build reliable, capable nano-spacecraft also will advance the technological base. So what might the next decade of planetary CubeSat missions look like? The examples that follow provide a sampling of the ideas being developed or proposed. I emphasize that this is a sample of the ideas. In the week or so it’s taken me to write this, I’ve come across at least a half dozen new concepts and I’ve left out a number of concepts I already knew about. If you’d like to see more examples of mission concepts and technologies, look at the presentations from these recent lunar, Mars, and asteroid workshops. The first CubeSat mission into deep space will likely be JPL’s twin INSPIRE spacecraft. The goal is to prove the technologies and operations to enable future missions. The only destination is to get tens of millions of kilometer into deep space while operating a simple payload (a magnetometer and camera). The design problems the engineers are having to overcome are the same that all future planetary CubeSat missions will face, making this mission a pioneer. I’m not aware that a launch date has been set. More information here for the Scout mission; here for the solar sail. Credit: NASA. 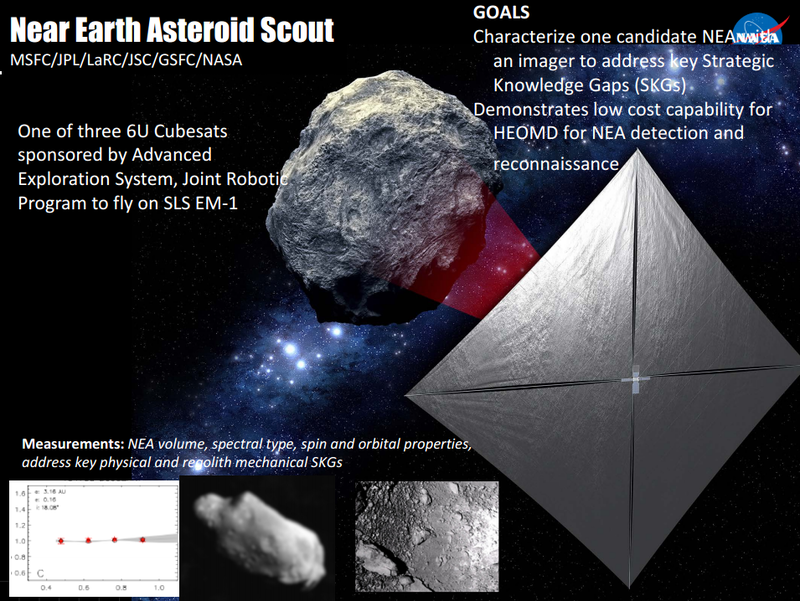 The Near Earth Asteroid Scout CubeSat mission will marry technology developed for the INSPIRE mission with a small solar sail system developed by NASA’s Marshall Space Flight Center. The mission team will need to develop methods for precision deep space navigation and operation to allow its CubeSat to perform a slowand close flyby of its target asteroid. As the spacecraft closes in on a small asteroid, it will take images in four colors with resolutions of as high as 10 cm per pixel. The spacecraft will be carried aloft on the first flight of NASA’s Space Launch System (SLS), currently expected in 2018. The Lunar Flashlight mission is the third approved planetary CubeSat mission that I am aware off. Like the Near Earth Asteroid Scout, it will use a solar sail, in this case to propel itself to the moon and enter orbit. Once in orbit, the spacecraft will make use of the highly reflective sail to cleverly solve one of the problems of lunar exploration. Thanks to previous missions, we strongly suspect that the permanently shadowed, extremely cold craters at the moon’s southern pole harbor some amount of ice. What we don’t have is a map of the distribution of those ices because, well, it’s dark in those craters and cameras and imaging spectrometers see only shadow. The Flashlight spacecraft will use its solar sail to reflect sunlight into the craters, providing the light needed for the mission’s spectrometer to map the distribution of ice over the course of 78 orbits. Like the Scout mission, the Flashlight mission will require a reliable spacecraft (the mission will take approximately 21 months to complete), precision navigation, and sophisticated operations on a nano-spacecraft budget. Also like the Scout mission, the Flashlight mission will launch on the first SLS flight. A key question for both our moon and for Mars is how the distribution of water and ice varies across their globes with the time of day and location. These CubeSat missions would use miniaturized infrared spectrometers to map water across their surfaces. The spectrometer for these missions would be a miniaturization of the 11 kilogram New Frontiers Pluto spacecraft’s instrument to ~2 kilograms. These presentations are frank about the challenges facing designers of planetary CubeSats. The proposers state that supplying sufficient power and relaying data back to Earth are two key challenges. For the former, they propose to use next generation solar cells; for the latter, they propose to relay data through larger spacecraft in orbit around these worlds. At Mars, the large, traditional orbiters such as the Mars Reconnaissance Orbiter and MAVEN carry relay systems designed to support lander and rover missions. These larger orbiters could also relay data from orbiting CubeSats. The presentations also list a number of other design challenges including how these spacecraft would be placed in orbit, thermal and radiation protection, and sufficient autonomy to operate with low cost mission support. Exposing design issues such as these is one of the important roles of these early concepts; they focus attention on areas where solutions are needed. 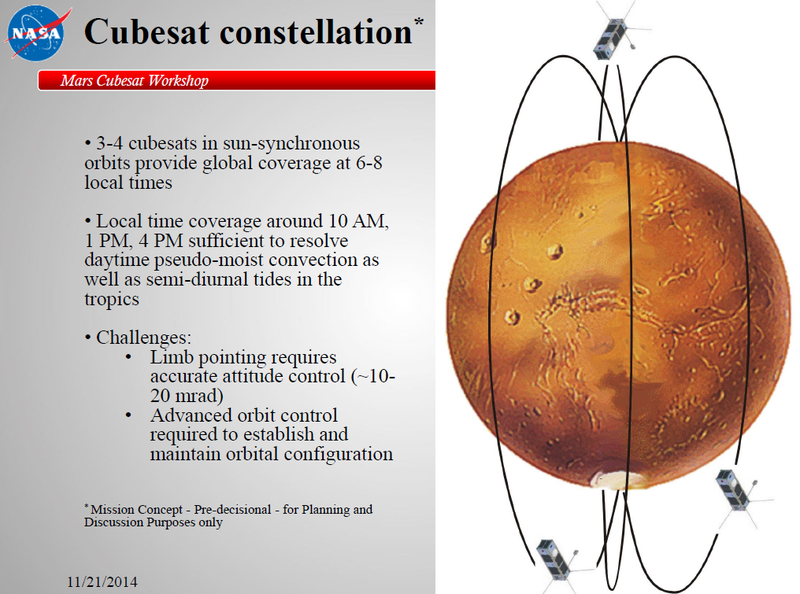 Several teams are working on enhancing the communications systems of CubeSats. Once concept from a team at JPL, for example, would support data rates from Mars of 8,000 bits per second compared to 500,000 to 4,000,000 bits per second for the Mars Reconnaissance Orbiter. If a Martian CubeSat satellite has to relay its own data back to Earth, though, operating the communications system and the scientific instrument at the same time may stress its power system. More information here. Credit: NASA. The small size and low cost of CubeSats allow scientists to propose networks of spacecraft that make simple measurements at several places at once. Traditional large spacecraft typically carry highly capable instruments, but the cost of the spacecraft and its instrument often limits the mission to a single orbiter that can take measurements at just one location at a time. Many of the proposals for CubeSats for Earth observation are for networks of satellites that make simple simultaneous measurements at multiples places across our globe. The instrument proposed for these Martian weather satellites would have two spectral channels, a single detector per channel, and a single telescope. The equivalent instrument on the Mars Reconnaissance Orbiter now at Mars has nine spectral channels, 21 detectors per channel, and two telescopes optimized for observations in different spectral bands. More information here. Credit: Malin Space Science System and Stellar Exploration. Concepts for planetary nano-spacecraft aren’t limited to orbiter and flyby spacecraft. The Dandelion concept would place several CubeSat-sized landers on Mars to make simple dispersed seismic and weather measurements. 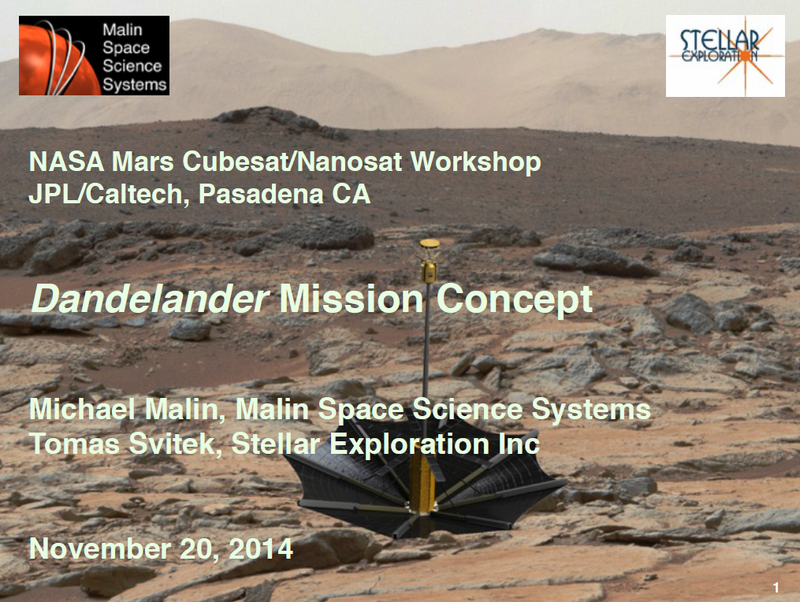 The lander looks rather like an upside down umbrella with a 3 U (10 x 10 x 30 cm) CubeSat as the handle. During descent, the lander would descend with the decelerator – what looks like the canopy of an umbrella – pointed down to slow the lander to enable a soft landing. After touchdown, the craft would deploy solar cells, a seismometer, and a mast with cameras and meteorological instruments. Then each lander would then patiently gather data over the next Martian year (two Earth years), relaying its data through an orbiter back to Earth. Other concepts, such as the Hedgehog, propose to deploy nano-landers on asteroids to explore the surface under the guidance of a nearby mother craft. 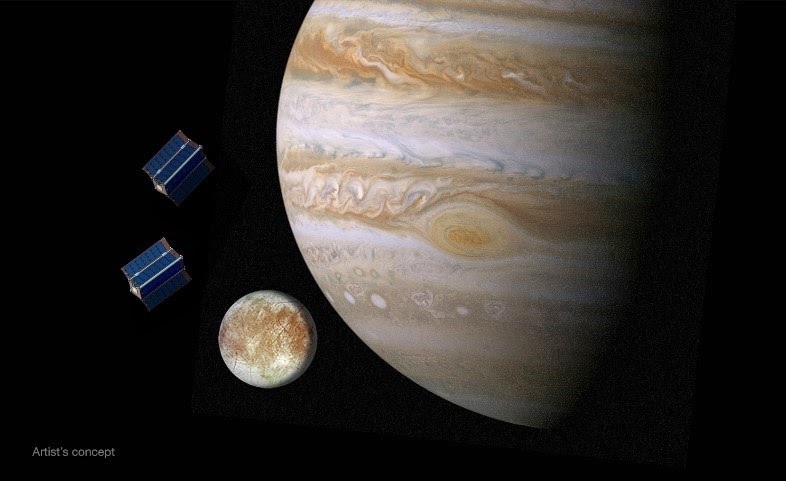 NASA plans to launch a large Flagship mission to Europa in the 2020s that will cost around $2B. Last year, NASA’s Jet Propulsion Laboratory solicited ideas from universities for CubeSat spacecraft that could serve as auxiliaries to enhance the mission. JPL selected ten concepts from universities for further study. Little information was released on the proposals other than a curt statement that read, “The universities' Europa science objectives for their CubeSats would include reconnaissance for future landing sites, gravity fields, magnetic fields, atmospheric and plume science, and radiation measurements.” I’ve heard rumors that one or more of the proposals may include long-lived CubeSats that would make multiple encounters with Europa. 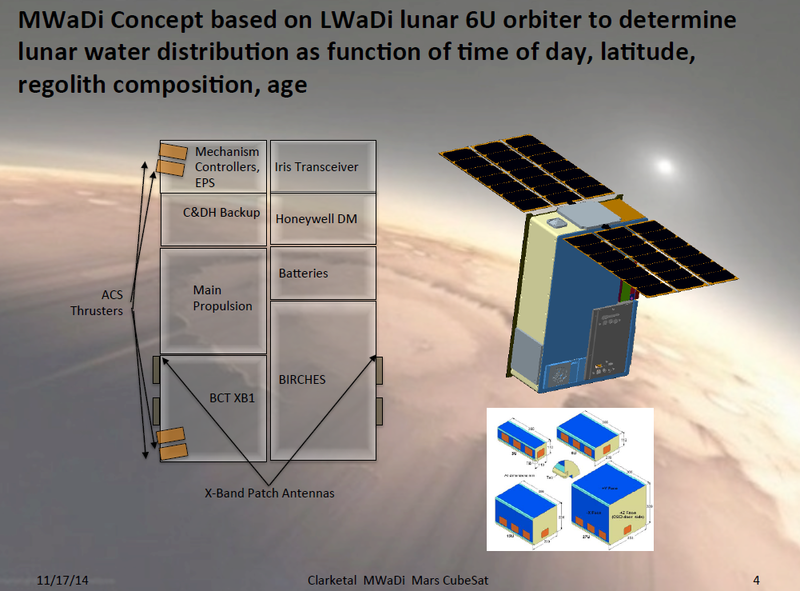 I suspect that these proposals may be for CubeSats that would conduct magnetometer or radio science flybys that would study the ocean depth and perform gravity studies of the moon’s interior. 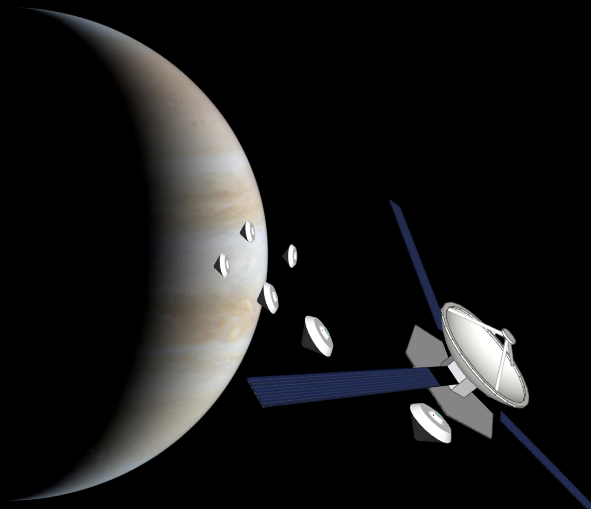 Both studies would require simple payloads and low data rates but many passes close to Europa and each CubeSat pass would add to the number the mother spacecraft does. Perhaps one or more proposals would orbit Jupiter from outside the high radiation fields to continuously scan Europa from afar for active plumes of water and ice expelled from the ocean beneath the icy crust. Other proposals might include CubeSats that image the surface from heights too low to be deemed safe for the main, expensive spacecraft. Sometimes, being tiny may be an enabling capability in its own right. NASA once had the technology to build and test heat shields that could withstand the searing heat of entry into Jupiter’s atmosphere by a large probe, which enabled the Galileo mission to do so in 1995. Since then, that entry technology has been lost and it is too expensive to replicate. A team lead by John Moores from the Centre for Research in the Earth and Space Sciences (CRESS) at the York University in Canada has proposed that a spacecraft could carry up to six atmospheric probes that incorporate CubeSat technologies to make them small and lightweight. The peak heat load these probes would experience during entry would be one-seventh that of a traditional large probe, enabling these probes to be built with existing entry technologies. Each probe would be too small to carry a full complement of instruments, so the instruments would be divided among the probes. Jupiter’s atmosphere is complex and the Galileo probe studied it in just one location that turned out to be atypical. Micro-probes might allow scientists to study additional locations from within Jupiter’s atmosphere. Multiple space agencies have shown that they are serious about developing the technologies for scientific CubeSat missions. This latest request from NASA gives the scientific community a chance to propose their ideas to both develop the potential of CubeSats and to conduct meaningful a scientific mission. I’m looking forward to seeing what creative idea is selected. Note: This version of this post corrects an error on the final figure that originally showed the wrong years. The 2016 proposed budget plan would provide increases in most science programs over the rest of the decade. All figures are based on either actual prior year budgets or budgets proposed in the FY 2016 President’s Budget Request Summary for NASA. 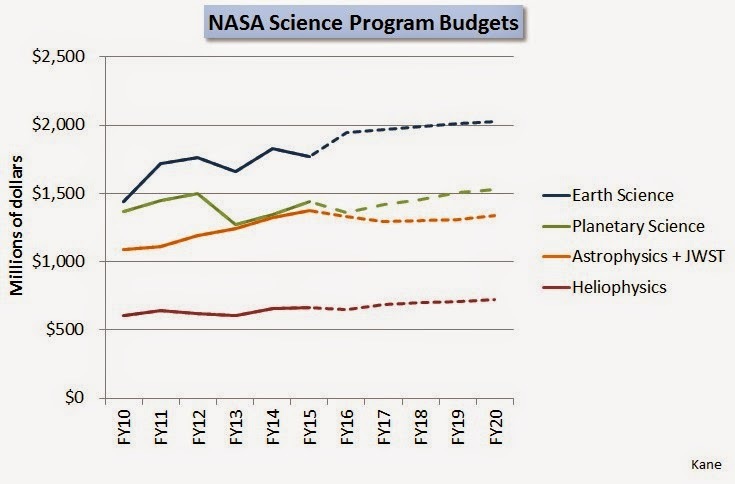 This figure shows actual and budget projections for NASA Planetary Science program from the President's budget proposals over the last several years. 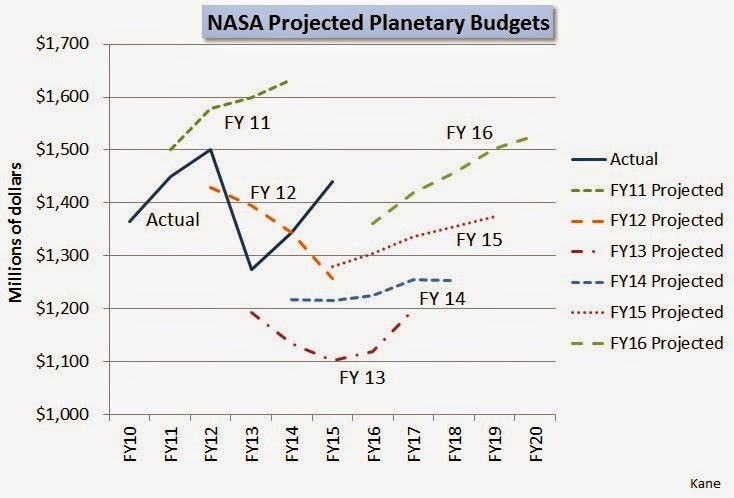 The FY12 and FY13 budgets proposed steep cuts in the planetary program. Budgets since then have proposed increasingly robust future budgets. A dedicated mission to explore Europa is approved as a formal mission. (In federal budget speak, the mission gets its New Start approval.) Finally! The projected budgets for the mid-cost ($700M to $1B) New Frontiers and low-cost ($450M) Discovery programs show healthy increases in the projected for 2017 to 2020. If carried through in future budgets, these increases would result in several more planetary missions than was assumed in last year’s proposed budget. As a one year, Fiscal Year 16, proposed $1.36B budget, the document asks for a top line Planetary Science Division budget that is a small 5.4% cut from the actual FY15 budget that was approved by Congress. The budget includes sufficient funds to continue all missions in development. It also includes funds to continue all missions in flight except two (more on this in a moment). Among those missions is the Cassini mission at Saturn that would be funded through its planned 2017 end of mission rather than be terminated as previous years’ budget proposals had implied. Actual and FY16 projected budgets for each of the major programs that fund current missions in flight and develop new missions. The major changes in each budget trace the peak funding ramps and declines as major missions are developed. See the next figure for details on spending ramps for individual missions in development. So net, the proposed FY16 budget continues a strong program but incorporates important small cuts. For the past two years, Congress has added $80M and $85M to NASA’s proposed budgets to work on a mission to Europa. The proposed FY16 would reduce funding from the FY15 total Europa budget of $100M to $30M. The FY16 budget proposal, like the FY15 proposal, proposes to terminate the Mars Opportunity Rover and the Lunar Reconnaissance Orbiter missions, even though their spacecraft remain healthy, for a savings of $26M. It seems likely that Congress will ignore these proposed cuts and the final budget will have more than $30M for the Europa mission and will continue the two missions proposed for termination. Congress did so last year when a tiny Europa budget was proposed and the same two missions were proposed for termination. Proposed spending for missions in development. The OSIRIS-ReX asteroid sample return mission and the InSight Mars lander will launch in 2016. For future planetary mission plans, the real news is not in the proposed FY16 budget (business as planned with the addition of formally starting work on the Europa mission) but in the projected 2017 to 2020 budgets. These projected budgets lay out the vision for NASA's road map of future missions. 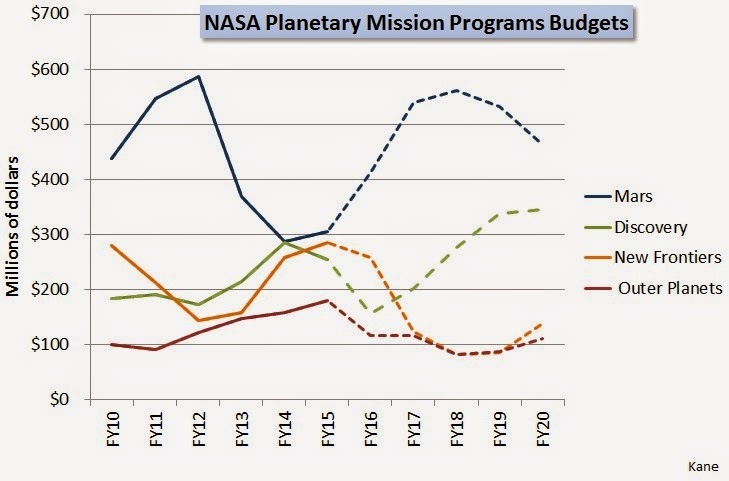 To develop a mission, NASA’s managers need to keep track of both the current year budget (dollars they can actually spend) and those projected budgets. They cannot undertake a new future mission if funding is not projected to support it. While each current year’s budget is passed by Congress, projected budgets are set only by officials deep within the President’s budget office. It was the lack of projected future funding for the Europa mission in past projected budgets, for example, that prevented NASA from committing to this mission even though Congress repeatedly added significant funding that could be spent in each year. The FY16 budget projections add a continuing stream of funding for the Europa mission while adding funding for the Discovery and New Frontiers mission programs. 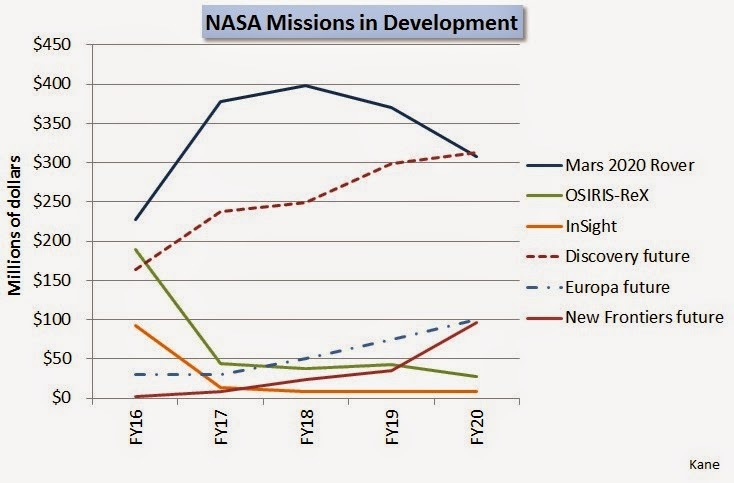 While the FY16 budget gives the Europa mission its New Start, the funding ramp through 2020 is slow. The budget document doesn’t say anything about when the mission would launch or its expected total cost. (I have heard, though, that NASA concluded that a bargain basement $1B mission wouldn’t meet the scientific goals.) Based on the slow ramp (even if Congress increases it somewhat as I expect), the launch seems likely to occur in the mid-2020s. To develop a mission expected to cost somewhere around $2B based on mission concepts, annual budgets of several hundred million dollars are needed. This budget bulge would not happen until after 2020. If the eventual mission launches on the SLS rockets NASA is currently developing, flight time to Europa would be about two years versus six and a half years if launch on a commercial rocket. While the SLS seems like the obvious choice, this is an expensive system that has yet to complete development and prove itself while the commercial launchers exist today. To return to the big picture, this is the first proposed budget for NASA’s planetary program that I’ve been excited about in some time. It addresses all the priority missions and programs identified by the scientific community in the last Decadal Survey. There is the niggling worry that seeing this program executed will require continued support by the President’s budget officials and Congress for the next decade. The FY16 budget – once Congress fixes those small proposed cuts – is a bold vision for what I believe will be an exciting decade leading to the launch of several new planetary missions.